I started writing my race report for the event in Frontenac, when I realised that I was probably not going to say much different then I did last year. So I decided that maybe I’d write a quick report on the entire series. If you love to run, you need to try Snowshoe running. It’s unlike anything you have ever tried, but three times as fun. It is hard work, but you are always in control of the amount of effort you put into it. Being able to run on trails that would be (otherwise) inaccessible is an amazing feeling. Whether you are running through an open field or a snow lined canopy within a bush, winter running does not get any better than this. I should also add that if you are after a cardio workout, you get all the benefits of working your hardest interval session without the pounding of running on pavement. The series is sponsored by Dion Snowshoes, directed by Spafford Health and Adventure and hosted by different people who have fallen in love with the sport. You will see the hosts ( and the directors ) pulling on shoes at some of these events. 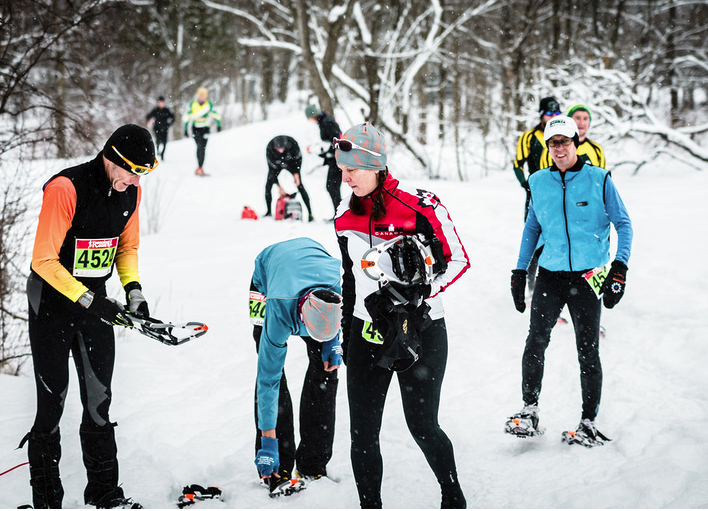 * February 28 – March 2, 2014: Dion US Snowshoe Running Championships – Bennington, Vermont, USA (Open to International/Canadian racers too. Note: Not part of Dion Eastern Ontario Snowshoe Running Series). Picture yourself arriving at a friends house for a day of skating. It’s light, jovial and fun. In fact, you may not even recognize that this is a race at first. Once the start comes, it becomes purely about business for some but good fun for all. On the trail, there is a good chance you will be encouraged at least 10 times by someone. After the race, it returns to the light and fun atmosphere. During the awards, it is normal to hear jokes being cracked and laughing as people drink their coffee and eat their post race meal. I don’t have a pair of snowshoes!? There are some limited pairs you can borrow from Derrick, but you need to contact him early to make sure a pair is reserved. And no…they are not the same type of shoes your parents may have used to trek through the bush. I have to say, post race is my favorite. Sitting around and chatting with people while the awards and draw prizes are handed out. There is never a shortage of draw prizes and they range from books, fleece socks or other useful gear that runners can never be short of. Check the website out, drop me a line or contact Derrick or Sara directly!